I've used the ML-2241K mono Laser printer in Korea. I'm still using the printer but I'm now living in America. Is there any toner for the printer instead of the old toner I was using? The compact Samsung ML-2241 is suitable for homes and offices. This monochrome laser printer delivers excellent texts and graphics at a reasonable speed. The ML2241 by Samsung can print on a wide range of media using black toner. The maximum print resolution is 1200 x 600 dpi. However, the Samsung ML-2241 lacks Wi-Fi connectivity and an LCD display. The Samsung ML-2241 mono laser printer folds up into a neat cube. It has an extendable paper tray that can hold up to 151 pages. The output sheet can handle up to 100 sheets and the capacity of the black toner cartridge can yield up to 1500 pages. The Samsung ML 2241 has dimensions of 353 x 209 x 298 mm and weighs 5.9 kg. For connectivity, the Samsung ML2241 printer has a USB. The ML-2241 laser printer is ideal for personal use. It can work with Windows and Macintosh operating systems, and even Linux. Print speed is adequate at 22 ppm and print quality is pretty decent as well. Plenty of crisp, neat characters were visible on every page we printed and toner output remained dark whilst greyscales were smooth. Furthermore, the Samsung ML-2241 laser printer is very compact and has a sleek, modern design which fits well within most workspaces. 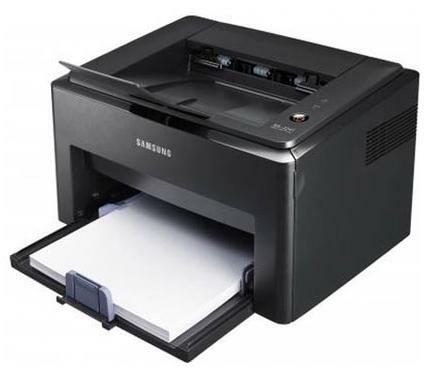 Unlike other new printers, the Samsung ML-2241 does not have an LCD. Connectivity is limited to a USB cable , as the ML2241 printer does not have built-in Wi-Fi or Ethernet.